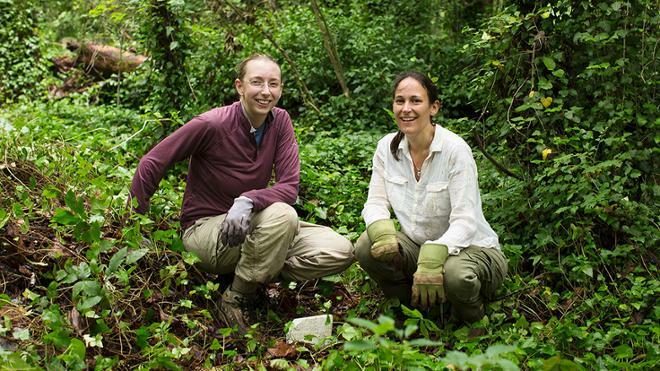 One Saturday morning in June of 2016, two University of Richmond faculty members from different disciplines went to East End Cemetery to help clear a seemingly endless expanse of overgrowth. 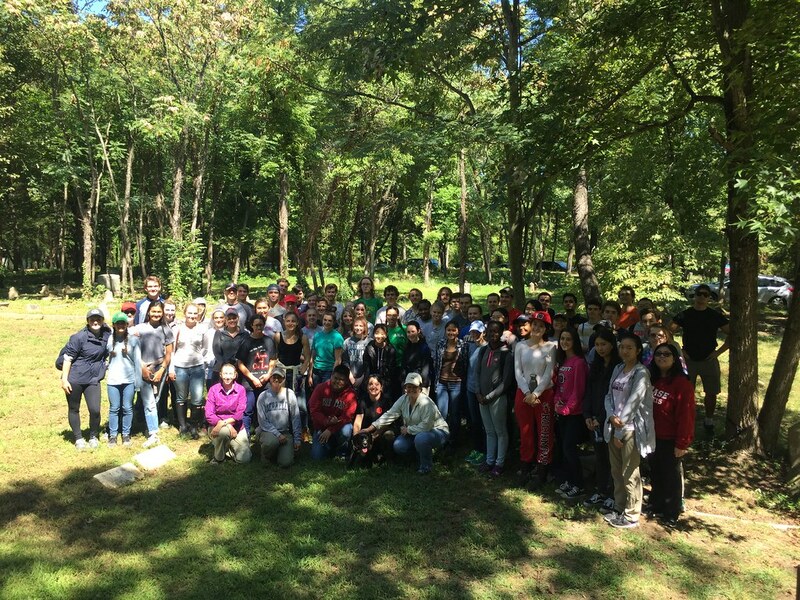 During the previous academic year, Kristine Grayson, assistant professor of biology, introduced her Integrated Biological Principles II students to the historic African-American cemetery for a human demography lab with fellow biologists Emily Boone, Jory Brinkeroff, and Malcolm Hill. Elizabeth Baughan, associate professor of classics, learned about the cemetery at an RVA Connections dinner at UR Downtown in conjunction with the special exhibition All Our Sorrows Heal: Restoring Richmond’s East End Cemetery featuring photographs by Brian Palmer and Erin Holloway Palmer. 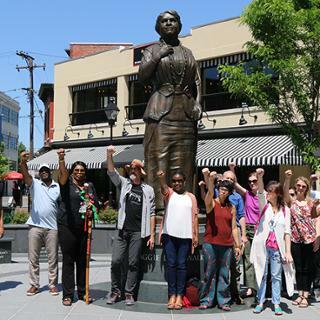 There was nothing special about that summer work day, planned when the two were paired together during a community-based learning fellows workshop hosted by the Bonner Center for Civic Engagement (CCE). Except that it was one more building block in the University of Richmond’s growing commitment to a once-forgotten place and symbol of racial inequality in our city. In fall 2016, Baughan included a single workday in her Introduction to Archaeology class to widen the scope of the students' community engagement. "Even though the time commitment and coursework related to the East End experience was small, it seemed to have a big impact on the students," Baughan said. "Throughout the rest of the semester, students kept referring back to the experience in further journal entries and even in final exam essays." Similarly, Grayson and her colleagues in the Department of Biology were witnessing the power of sustained engagement with the site and launched an application to gather data for a digital gravestone map with the UR Spatial Analysis Lab. Currently, a family member trying to locate their relative’s gravesite – one of an estimated 13,000 – may have a nearly impossible task in front of them. By working with volunteer coordinator John Shuck, the students are able to contribute their data to a larger spatial database. More and more time at East End Cemetery showed the fellows that with increased class connections, their impact might be substantial – both on students and the community – and with support from the CCE, Baughan and Grayson launched the East End Cemetery Collaboratory this fall. "The CCE has been wonderful in supporting the Collaboratory, with faculty stipends, arranging our meetings, coordinating and funding transportation to the work days for students in multiple classes, providing supplies (such as D-2 biological solution for cleaning the gravestones), and facilitating a partnership with Virginia Commonwealth University (VCU), which we feel is a really important part of the Collaboratory," Baughan said. Three other UR faculty – Doug Winiarski, associate professor of religious studies and American studies; Emily Boone, director of biological instruction; and Jory Brinkerhoff, associate professor of biology – joined the Collaboratory, as well as two faculty from VCU – Ryan Smith, director of graduate studies and professor of history, and Susan Bodnar-Deren, assistant professor of sociology. 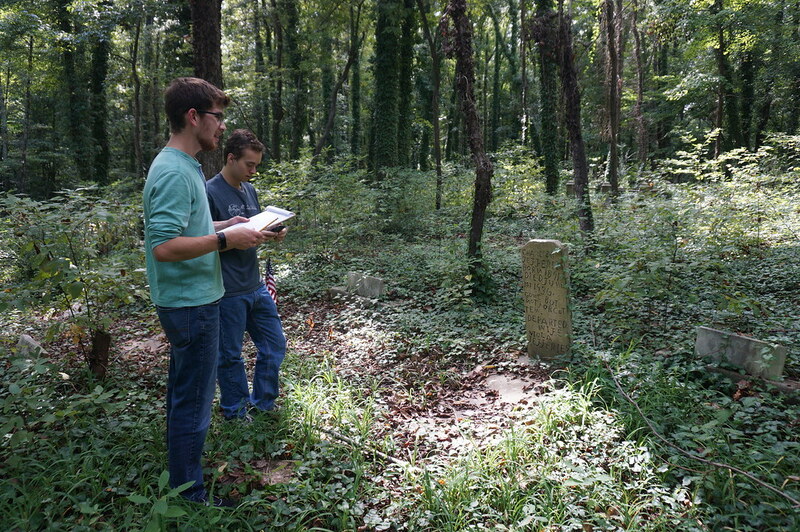 "By pooling our knowledge, effort, and experiences, we hope not only to learn from each other but build upon each other’s (and our students’) work but also to produce more (and more meaningful) results, whether that means mapping more quadrants of the cemetery, revealing more headstones, recovering and sharing more stories, or strengthening community connections," Baughan said. The East End Cemetery Collaboratory has met for workshops with the Friends of East End Cemetery to listen, exchange ideas, and refine their vision for their gravestone mapping website that is now in the works with the Digital Scholarship Lab and coordinated multiple work days at the cemetery this semester. 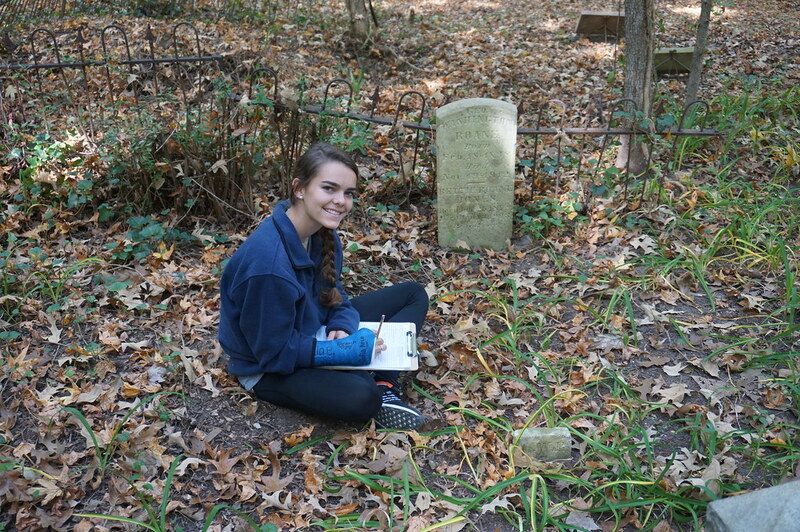 "Working at the cemetery has made tangible some of the concepts we have discussed in class, whether principles of archaeological survey or ideas about the importance of a physical monument in carrying on someone’s memory," Baughan said. "But more importantly, it has opened up new perspectives and new connections between the course content and other parts of the students’ lives." University of Richmond and VCU students will share their work with other members of the Collaboratory and with the community at a public symposium at UR Downtown on Friday, December 8, 5-7 p.m., and next semester, four additional courses will connect to East End Cemetery. "Together we have grown this experience for our students far beyond what each of us could have achieved in our classes alone," Grayson said.